DiscoverE is a lively program series providing the framework for outdoor exploration experiences for young state park visitors between the ages of 4 and 12. The three programs provide a continuum of learning and recreation experiences as participants progress in age. EcoCamps are for teens aged 12 - 17. These all day experiences run for three days. Hands-on interactive activities allow our sturdents to explore nature in unique, in depth significant ways. Registration is required. Camps are filled “first come, first served” based on the date the application is received. 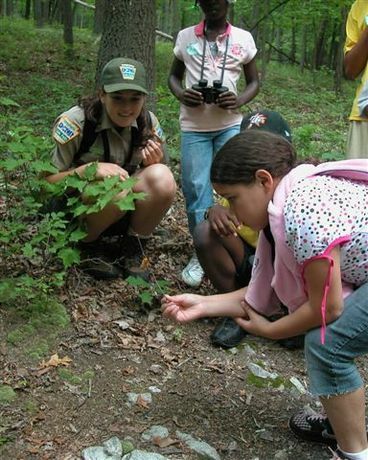 Pennsylvania State Parks’ DiscoverE camp series is designed to help children learn about the world around them. These three active environmental education programs allow youth to explore the natural world with others of the same age. Children who progress from one level to another will continually grow in their understanding of the environment and their role in it. These programs provide the unique combination of active learning outdoors while encouraging stewardship and appreciation of our natural resources. A love of the outdoors can start here! The EcoCamp series is designed to assist older students in understanding and interacting with their environment. These two programs allow for a deeper experience with recreation and developing their own experiments. Each program provides a meaningful but different experience interacting with the natual environment. The 2019 Summer Camp Brochure, provides more information. To register, open the Summer Camp Application form, print and complete the form, and then mail the form along with your payment to the address printed on the form. Please call 717-486-3799 or e-mail ra-nrspkingees@pa.gov for more information.